Sacred Space 2011 arrived in time for the start of Advent – excellent! I ordered from amazon.com and it came from amazon Germany. (Possibly because of a large USA army force resident there?) The prayer at the beginning is an ideal one for this time of year. hide the shining of your face from me. Not much snow here yet. At least, not much in comparison to other places. The car would still need to be dug out in order to get out of the driveway. 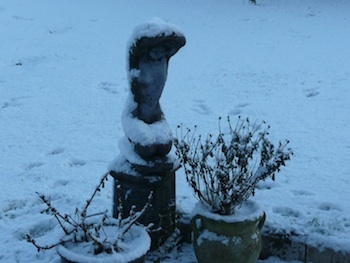 This entry was posted in Blog, Poems and Prayers and tagged Celtic prayer, Sacred Space, Snowy statue, spirituality. Bookmark the permalink. So beautiful, and I love the photo. I’m happy for you that it arrived in time! Good news that amazon.com came through on time! Thank you for sharing the Celtic prayer. I appreciate that image of God with us in the darkness. Enjoyed your 25th anniversary post, too. Good friends and good laughter are good medicine indeed. This really is a lovely prayer, Freda. Our car doesn’t need digging out, it’s stuck in the garage and won’t come out. Coward! We can walk but not drive. This weather is forcing all of us to adopt a lighter footfall on the earth.